If you have rafted on the Moab Daily stretch of the Colorado River over the last few weeks, you might have noticed a new addition to one of the Onion Creek camps. 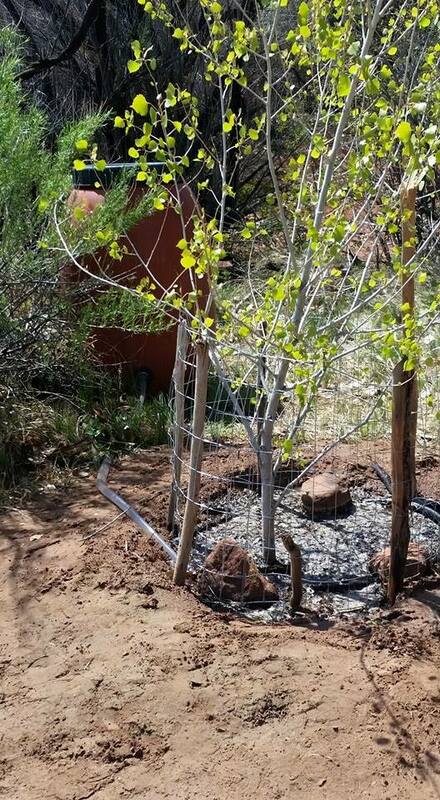 On April 10, 2015, a locally grown from seed juvenile Cottonwood tree was planted, with the permission of the Moab office of the BLM, in memoriam of Arlo Tejada, former co-owner of Sheri Griffith River Expeditions. Arlo loved the outdoors and spending time both telling and making stories. 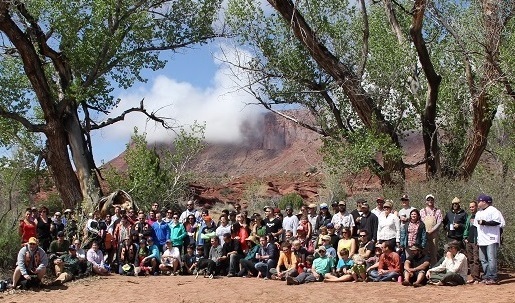 On April 18, 2015, nearly 80 of Arlo’s close family and friends met at Onion Creek to dedicate the tree to his memory, and then moved on to a celebration of life hosted by the Red Cliffs Lodge. Stories were shared, songs were sung and hugs were shared all around in celebrating the life of a man who was well known in the river and tourism community of Moab. Arlo was a strong advocate and lobbyist for the outdoor industry, and volunteered a lot of his own time to different committees and boards, including the Moab Travel Council, Utah Guides and Outfitters board and the America Outdoors Association Board. He was honored in December of 2014 with an Outstanding Service award by the America Outdoors Association for all of his efforts. The tree was donated to the family by Wildland Scapes. In order to provide enough water to the tree that it can establish a strong root system, there is a watering barrel set up near it. Sheri Griffith Expeditions guides will be taking a bucket or two of water to the barrel each day that they pass it when on the Moab Daily, and we appreciate anyone else who is willing to share in the memory of Arlo by pouring a bucket or two in the barrel when they happen upon it during the rafting season. As we’ve all noticed, the season is in full swing! Happy boating!